I have had the good fortune to visit many places in the world and meet people as part of my work. Indonesia was one of them and the most fascinating of all. That is a big call when I have also been to Papua New Guinea and Palau. 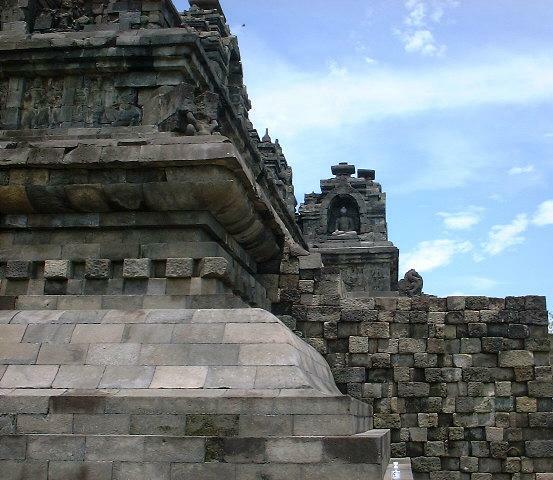 The photo at the top is of the Borobudur temple. 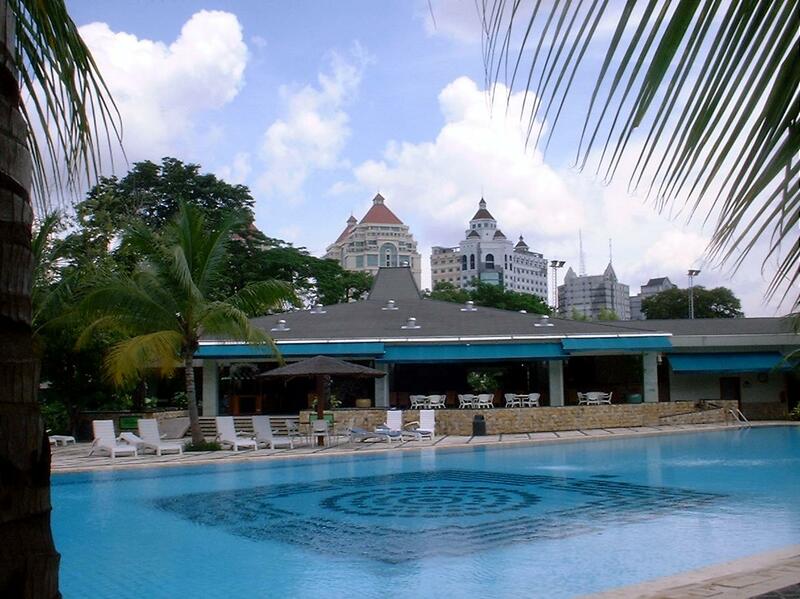 The pool at the Hotel Borobodur where I lived for almost 4 months while in Jakarta. It was owned by the generals and therefore safe. My role has four parts, two of which were completed by early January 2000. The first was to project manage a program which verified the contingency planning process for some of the so called “Critical Sectors” of the economy (Telecommunications, Air Traffic control, Power and fuel supply) this program also assisted the seven most important Government Agencies to develop effective contingency plans for their most important operations. The second part of my role was to assist with the establishment of the National Response Center for Y2K (Posko Transisi Tahun 2000). This operated from 28 December 1999 until 4 January 2000 when it was closed down due to lack of anything to do! The Posko was a truly remarkable thing! There were more than 60 people in it between 8PM on 31 December and 2 AM on 1 January for the date rollover. It was equipped with more computing power than many Government Agencies here could dream of. It occupied 1,000 sq meters (~10,000 sq ft) of the Ministry of Communication staff canteen area which was not being used because of the Muslim fasting month, during which the big event fell. It was one of the greatest challenges of my professional life to turn the grand ideas that my counterparts had for the Posko into something that was practical and workable. My efforts succeeded in many cases and failed in too many others! The next part of my role here are to assist the Government Agencies (the other sectors have their own funds to look after themselves) who have systems that are no longer working to fix the most important systems. This is a three stage process that firstly identifies all the failed systems in all the Agencies and lists them, determines which of these systems are the most important to repair and puts them in priority order and lastly to propose a method for implementing the remediation program in the shortest possible time. The final part of my role is to assist with whatever happens during the February 29 2000 period. With luck, I will leave on 7 March and return home for a little while. December was a very busy month for me. I worked an average of 14 hours a day during weekdays and about another 16 on the weekends. This meant little rest or time to communicate with people. This site is my way of trying to make up for that, now that I have a little more time. What is the reason for the extraordinarily long hours? For several reasons, the project did not start in early November, as it was originally scheduled. Instead, it started on 1 December and the work had to be compressed into that period. The other 8 projects put in a similarly large amount of work to achieve a very good result, under the circumstances. It is worth noting that the pessimistic scenarios which were being touted by CNN, the Gartner Group and others for SE ASIA were not founded on the facts as they were. I was well aware of the fact that there were few major problems in the region but no matter what reasons the media may have had (creating news?) they were wrong to misrepresent the truth so badly. I actually met with a CNN reporter and explained the reality of the situation. We produced a press release that showed that Indonesia was in good shape. None of the “good news” was reported, instead they ran segments which described in detail the things that could go wrong and proposing many unlikely scenarios where a small failure in a system “somewhere in Asia” could bring down banking or air traffic control systems! All this did was to give credibility to any ideas that they should have been clarifying. I was able to have a break from the intensity of the previous month from when the Posko closed earlier this week (written 8 January) and that has been good for me. The work starts to accelerate again on 12 January when the Government Agencies return from the Lebaran holidays where half of Jakarta seems to desert the city and return to wherever their parents live. The Contingency Planning part of the project was a great success. This was despite the belief of some parties that it would not be able to produce any worthwhile results. The success was largely due to the fact that the 17 consultants from all over the world put in a huge effort to complete their allotted tasks in a very short time-frame. The findings of the project were very positive. The key Communications, power supply, air traffic control and fuel supply sectors were quite ready for Y2K and their contingency plans were well up to international standards. The Government sector was, however suffering from the effects of the Asian Monetary Crisis and they were expecting several failures of important systems. The project successfully produced contingency plans to implement alternative procedures to carry out these functions. This success was one of the most pleasing results for any project that I have been involved with to date. It was great to hear the clients who were present at the meeting to accept (or reject!) the final reports, thank the consultants for helping them so professionally and practically. It made the hard work and missing out on a proper Christmas-New Year with family and friends worthwhile. If there is one lesson to be learned from this project, it is that the best way to get a challenging project done is to bring together people who know what they are doing, remove as many impediments as possible that may prevent them doing their job and ensure that everyone on the project has an agreed set of objectives. Now, I am part of one of those multi-national companies and I found myself asking questions along the same lines. I do think that there have been many cases where the problem has been exaggerated but there have been many more cases where it was necessary to convince decision makers that they needed to take positive action. In terms of the third world being forced to spend money on computer systems rather than on food, I think that the first thing to look at is where most of the aid money actually goes in any case. It is rare for more than 70% to reach the intended recipient, even for food support. It is clear from the work that I have been involved in, that the money has been spent on the most important systems that potentially affect lives, standards of living and support good Government. While it is possible that this has not always been the case, I suspect that it would be the same for nearly all other projects world-wide. I believe that it was. Without it, the Government would have been unsure of the real status of preparedness in the areas that we addressed. As well as that, the project set, as part of its objectives, the goal of ensuring that any contingency plan that was developed would be useful in the general case of the failure of an important system rather than just for a Y2K problem. That means that there is a lasting benefit to the organisation, after the 1st of January 2000. During the period from early January and 8 February, I have been working to identify the systems that have actually failed in the Government Agencies and make recommendations as to how these failures can best be remediated (repaired). This work has been difficult in an entirely different way. The World Bank proposed that there might be an extension of my project to incorporate some extra scope work to provide an additional technical resources to assist me with this large job. Unfortunately, the managing authority here (MKT 2000) decided that the administrative work to process the amendment to the contract was too much work. As a result, I am only able to address the seven most important of the 50+ agencies. These seven agencies have had most of the attention from all previous phases of Y2K work and this means that there is a large body of information about failures of systems in the Government sector that remains undiscovered. This worries me because the effects of the failures are likely to cause significant incremental inefficiencies in the operations of these organisations. It is my job to attempt to alleviate these types of troubles. It looks like the project may be extended for an additional 2-3 months, following the acceptance of the report on the findings from the current phase. One of the key findings was that there are a number of important operational systems that have failed in the Government Agencies. There is not a lot in the media about Y2K at the moment because there is no newsworthy item in the slow and somewhat tedious process of assessing the systems that have failed and allocating the limited funds that are available for correcting the problem. This has involved a large amount of fact finding and prioritisation as well as due political processes that are required to find and allocate funds from Aid grants, loans and Government procurement. From my perspective, this has been challenging and quite rewarding, now that a good outcome seems assured. The work here has also been interesting because I am living within a foreign culture. In most of the meetings that I attend the business of the meeting is conducted in Indonesian (One can hardly complain since it is their country!). Over the time that I have been here, I have managed to pick up enough of the language to follow what is happening but that can be very tiring. In the early days of this project, I had to rely on someone summarising the meeting for me afterwards which meant that I could not participate during the meeting. Now, I seem to have mastered the art of interjecting a few sentences of English into the meeting at key points! My speaking skills are not really good enough to attempt to discuss complex matters in Indonesian but, at least I can understand it. One highlight was when I gave a presentation to the National Economic Advisory Committee, which is chaired by the President Abdurrahmin Wahid, in the Binara Negara. Unfortunately, the president was unable to be there at the time but the recommendations that I made were accepted! It was the toughest presentation that I have ever given. I look forward to seeing one of my colleagues back here soon, to take over from me for the next phase of the project. Then I may return to the calm and peaceful surroundings of Canberra – as well as my family and friends – at the end of March. Jakarta is a place with a very long history. It goes back more than 600 years as a major city on the trade routes of Asia. It came to prominence from the perspective of the West when the spice trade was one of the main money earners for the British, Dutch and Portuguese empires. 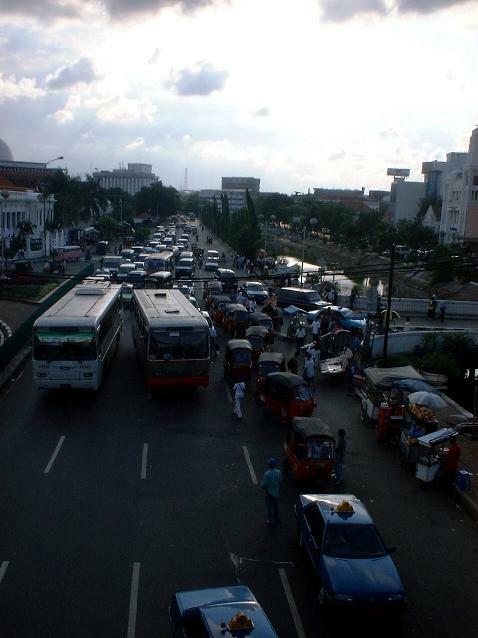 Traffic in Jakarta is a major feature of the place. It is constantly jammed and totally chaotic. There is not much more traffic than Sydney has but it is slower and absolutely unpredictable. The roads are shared by busses, trucks, cars, vans, motor scooters, Bajaj, bicycles and hand carts! Busses stop in the middle lane of a 6 lane road to pick up a passenger. Vehicles of all kinds park across two or more lanes near railway stations and shopping centres. The traffic is very quiet at the moment due to the Labaran holiday (the local name for Idul Fitri) which marks the end of the Muslim Ramadan month of fasting and praying. It would be an ideal time to get out and see things but for the fact that everything is shut! It was good to be able to spend a day last week visiting Kota with Fran. 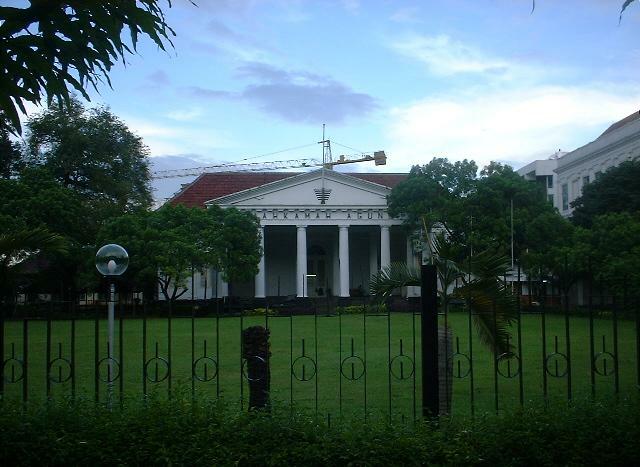 Kota is the old part of Jakarta which was built by the Dutch colonial administration. There are many buildings that date from the early 1700’s through to the late 1800’s. 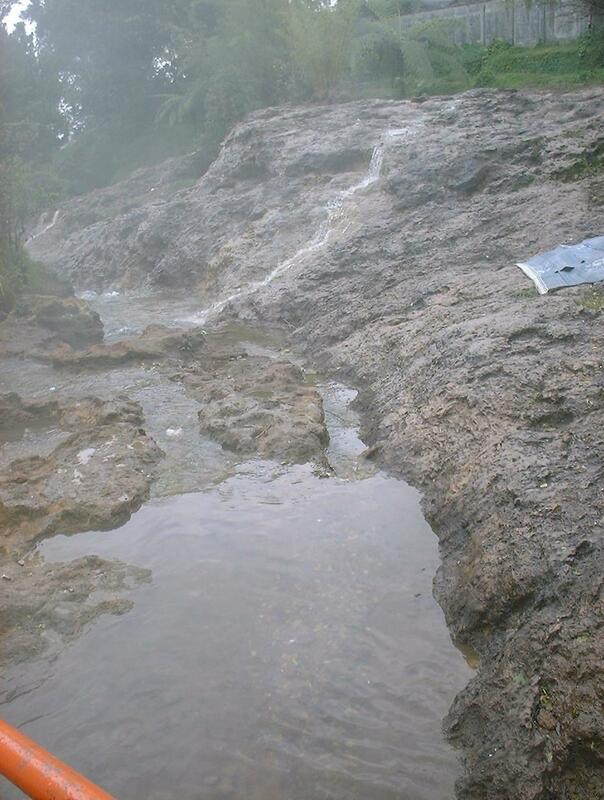 It is obvious why the area was so disease ridden when you look at the way that they formed canals which would be ideal places to breed mosquitoes and were also open sewers! Any place that has so much history must have interesting places to visit and it seems that there are many. Not very far from Jakarta are several active volcanoes and I expect to visit them later this month when people are not travelling to and from their relatives and when my partner and 11 year sold son are here. Apart from that one visit to Kota, I have only been able to find time for practical things like supermarket shopping and buying a digital camera (hence the renewed interest in photography!). I did manage to have a new jacket made for me which looks great, even if I do say so myself! All clothing that is made in Indonesia is very inexpensive at about 1/4 the cost of the same item in Australia. Apparently this is where a lot of it is made so there is no difference in quality – just the price. All imported items are just as expensive as anywhere else in the world. Food is a national obsession. I love the Indonesian food with plenty of chilli and vegetables. The supermarkets are well stocked with local produce and enough of the Australian style luxuries (corn chips, salsa and pinto beans especially) that I would prefer not to live without. The restaurants here that have Indonesian food are quite inexpensive. It is only when you want to eat Western style that it is expensive. Wine is in very short supply because local people do not drink it. A bottle of very average Australian wine costs around $30 compared to $12-15 in Australia. In mid January my partner and 11 year old son visited for two weeks. 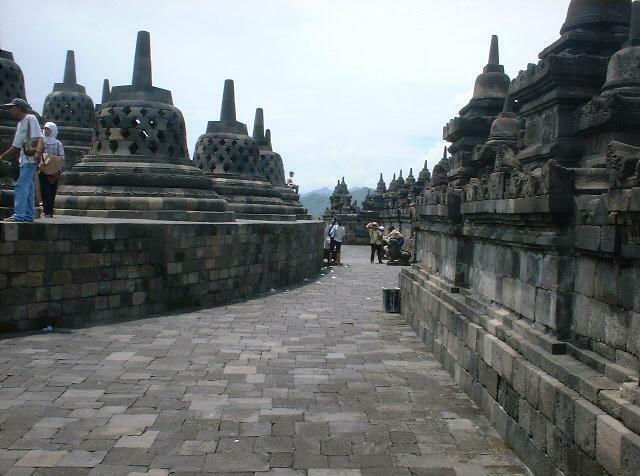 We had a four day trip to Bandung, Yogyakarta and Borobudur. 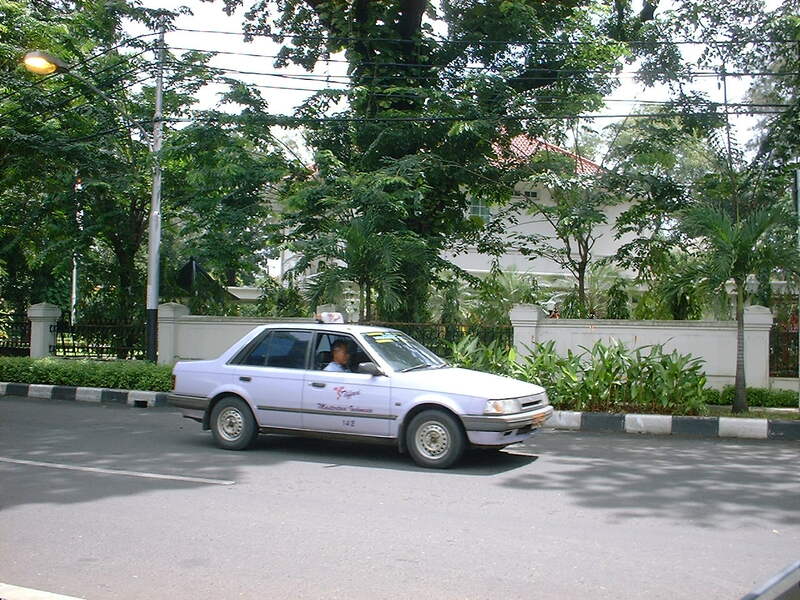 We also had a look at some of the sights of Jakarta itself. Tristan loved the place. He also enjoyed having cable TV again – especially the Cartoon Channel. (I suspect that I may have just gone overboard with the political history!). The country of Indonesia is Diverse and complex. A careful look at the map of the country quickly shows that there are highly unusual borders that owe more to colonial political convenience than to real communities of interest or geographical boundaries. Of particular interest is the closeness of Irian Jaya to the north of Australia, the fact that Sarawak and Sabah are Malaysian states on Kalimantan (with the independent country of Brunei as well) and the fact that Singapore is within sight of the islands off the coast of Sumatra. This has meant an uneasy relationship between the countries of the region as Indonesia sought to expand its influence in the region from 1950 onwards, annexing several areas from their colonial parents Holland and Portugal, in the case of East Timor. Java and Jakarta have been the political hub of Indonesia since Colonial times. Centralised administration of the territory has been entrenched for more than 300 years and there is resentment from the outlying areas. 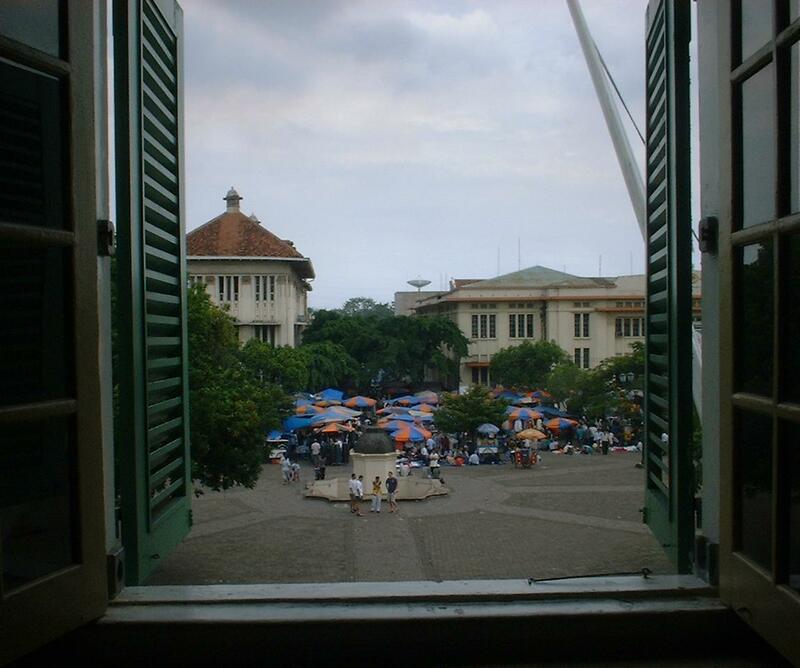 The main thing that unites Indonesia is its Dutch colonial past and a resultant of National sense of belonging. Nearly everything else should cause the nation to disintegrate. The cultural, religious and ethnic diversity as well as immense geographical separation do not encourage a single nation. The region abounds with the romantic and exciting. Krakatau, the island that disappeared in an explosion that was heard in Alice Springs, 2,000 miles away. Java, the place where Java Man was discovered, sparking a rethink, at the time, on the origins of Homo Sapiens. 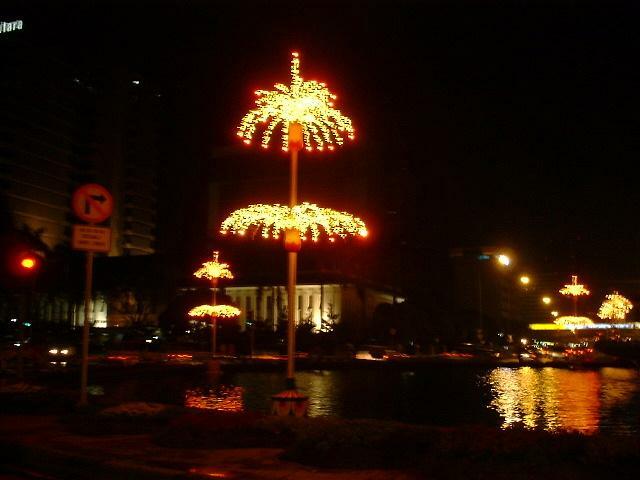 Jakarta, which was once known as Batavia, the Queen of the East for 200 years. Maluku, the original “spice islands” that started the huge trade wars between the Dutch and English. Komodo, where the giant Komodo Dragons live and so many places where wars have been fought over religion and territory for the past two or more millennia. To a geologist, the crescent shape of the islands from Sumatra, Java, Bali, Lombok through to Flores and Timor suggest that these islands are at the edge of a tectonic plate. The Asian continent and the Australian continent are pushing against each other here. Only last December, there was a 6.5 (Open ended Richter) earthquake in the sea The X on the map to the South-West of Jakarta shows where this earthquake was centred. There are two other plates that are crashing (at a rate of a centimetre or two each year!) into the region of Sulawesi and Kalimantan from the North West and North East. 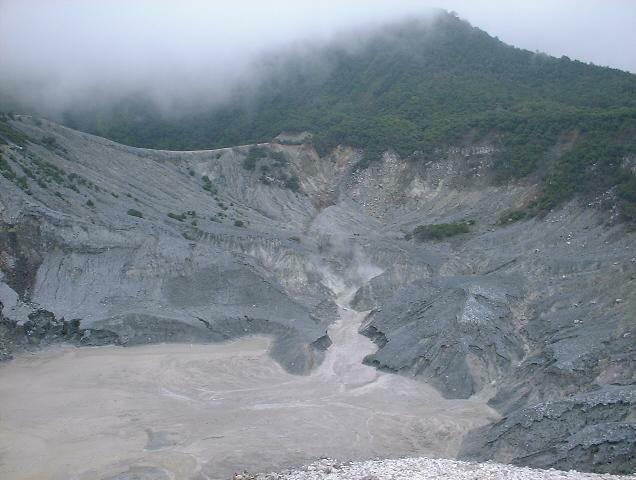 Because of all the tectonic activity, it is not surprising to find that there are many active volcanoes in the area. Krakatau is located in the strait between Java and Sumatra and was the site of one of the most famous eruptions of all time. The island virtually disintegrated in a blast that was heard 4,600 Km away in the South West and the resulting Tsunami was registered in the Gulf of Aden 12 hours later. Locally, the tsunami was estimated at 40 meters high and devastated local coastlines. Volcanoes are a major feature of the landscape from North Western Sumatra, near the Thai-Burma (Myanmar?) border through to Timor. They are also evident across Northern Sulawesi but most of Kalimantan is a result of tectonic uplift rather than volcanic activity. Palau is North East of Java and is about the same distance above the Equator as Java is south. There is a line between Lombok and Nusa Tenggara that divides the world. To the West there are Monkeys and to the East there are Macropods (Kangaroo, Wallaby). This was one of the things that got scientists thinking about Continental Drift. A quake measuring 6.5 on the Richter scale occurred while the team was there. It was one of the most powerful in recent history and several thousand people were reported to have evacuated their buildings in Jakarta fearing something bigger. I was in a ground floor room and did not feel anything but those on the upper floors of the apartment did. No great harm was done in Jakarta but lives were lost and a lot of damage was done to seaside villages closer to the ‘quake. It took three days for the news of the damage done there to reach the newspapers in Jakarta! The team at least deserved some credit for good planning. 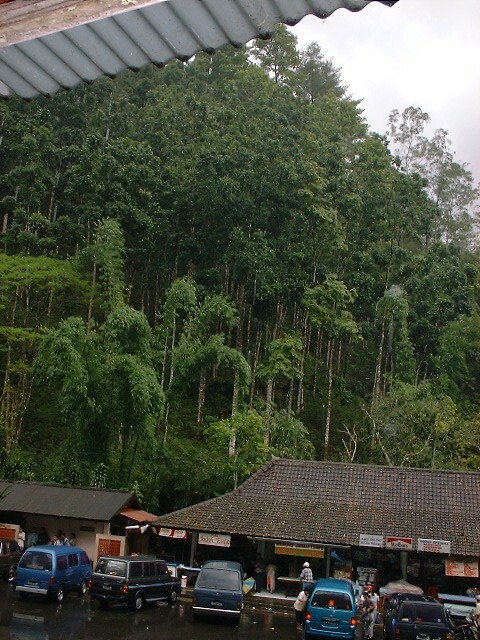 There are many large mountainous regions along the spine of Java, as well as in Sumatra and Irian Jaya. Sumatra, Kalimantan and Sulawesi provide some of the most important rainforest in the world, second only to Brazil in their extent. 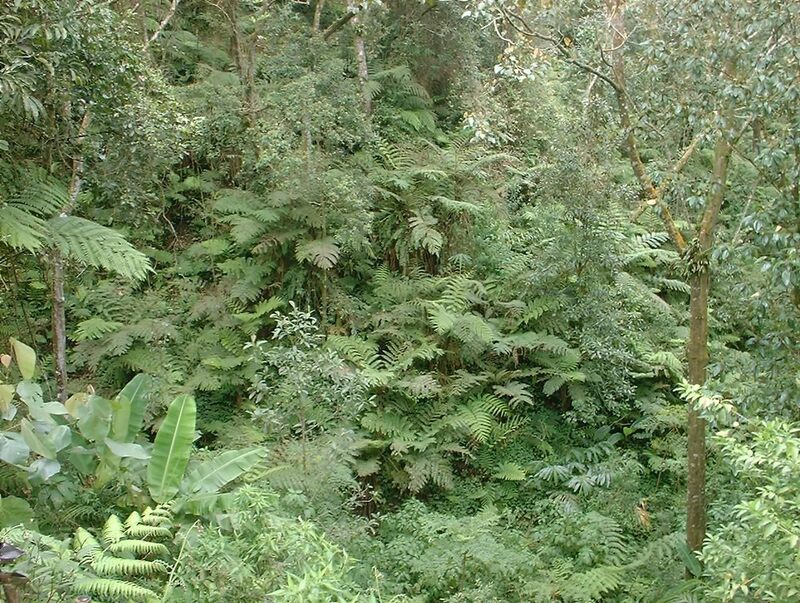 These rainforests and their inhabitants suffered badly during the fires in 1998 which burned for months and destroyed a large amount of the forests which are not quickly regenerating. This is Indonesia (Christopher Scarlett and Gerald Cubbit – 1995). This gives a good “New Order Orthodox” history. The photographs and geographical information are very good. I have also used information from the very frank and descriptive discussions that my colleagues here have shared with me. In a political discussion of Indonesia, it is not possible to avoid religion as a key issue. The whole of the archipelago has been swept with waves of Buddhism, Hinduism, Islam and relatively small but important influences from Christianity during colonial periods. The parts of the country that are closest to Malaysia are more staunchly Muslim and are inclined towards fundamentalism. Bali is divided between Muslim and Hindu. Irian Jaya is much like the rest of the Island of Papua (not New Guinea, that refers to the islands to the North East of Papua). The politics of Indonesia owe much to its history. There is no real ethnic unity and there are more than 300 languages spoken. The common language is Bahasa Indonesia which is a derivative of Malay. This common language came as a result of trade between Java and outlying islands and was accelerated by colonial interests who wanted a single language for the region. 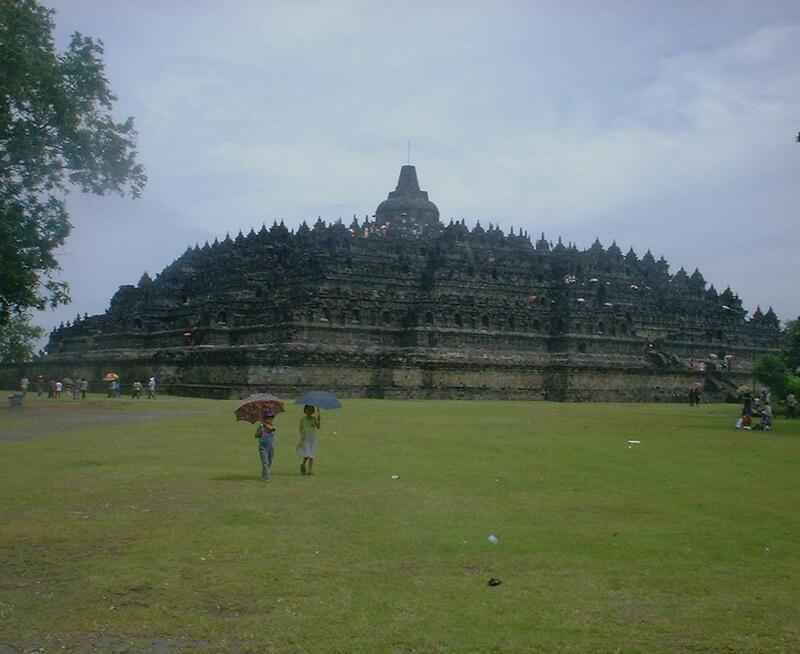 In the 1st century AD, there is evidence of a codified law which was in existence on Java and Sumatra and survived to some extent the many religious invasions that followed. 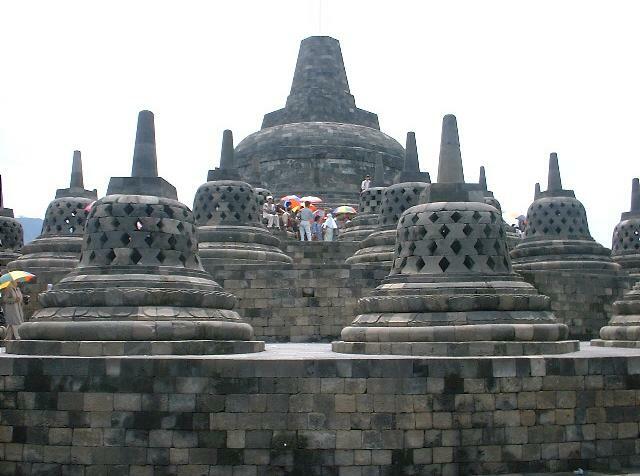 What is now Indonesia was ruled by Buddhist and then Hindu kingdoms. The sultans took their turn as Islam became prominent in Kalimantan, Sumatra, the Moluccas and then Java from the 13th century through too the 16th. The previous cultural influences seemed to co-exist for quite some time as one gradually gained ascendency over the previous. 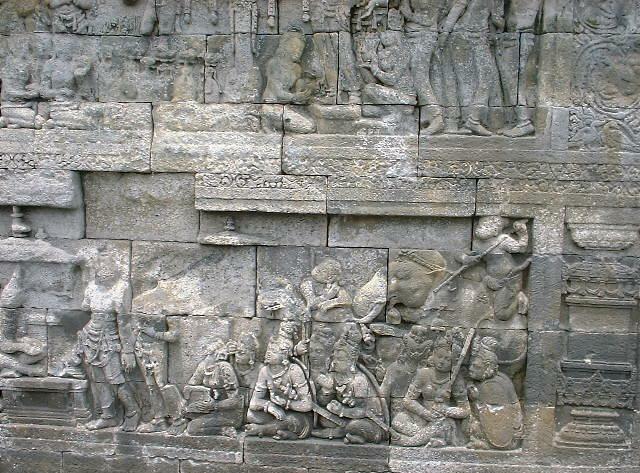 The Javanese, were particularly good at taking whatever they thought was good from each new culture and incorporating it wherever it fitted with their quite stable culture. 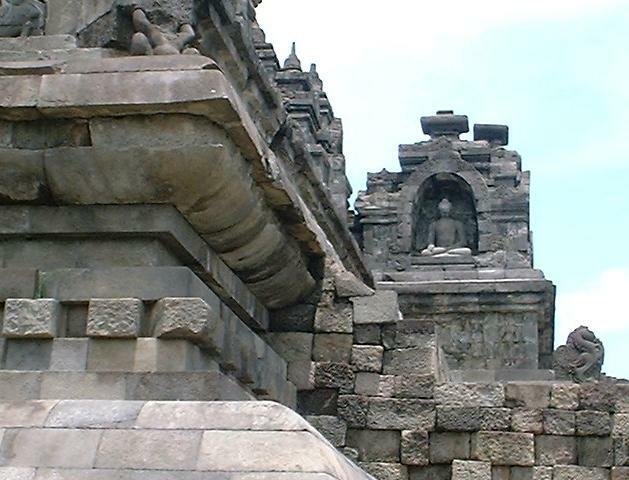 The Balinese resisted Islam and remains a stronghold of Hindu culture today. Irian Jaya was never really influenced much by any religions beyond the narrow coastal areas. Many parts of the Highlands of Sulawesi and Sumatra have held onto their own religious beliefs, despite the predominance of Islam. Europe started to take an interest in the spice trade when Portugal decided that it could make a profit from the coveted pepper, clove, nutmeg and cinnamon trade which was then centred on Malacca on the Malay peninsula. The Portuguese also saw a chance to reduce the influence of Islam in the region and took control of Malacca in the early part of the 16th century. With a religious and profit motivation, they managed to control the spice trade until the political landscape changed in Europe. The Dutch and British became interested in more than just trading and consuming the spices. It was the Dutch, as a result of their war of independence against Spain and loss of access to Malacca, that had the first large scale alternative trade arrangements. This led to the formation of the VOC or Dutch East India Company which temporarily cooperated with the British East India company. In 1618, Batavia was established by the Dutch to act as an alternative port to Malacca and it quickly grew to overtake its rival as the most important port in the East. The Dutch effectively controlled the spice trade from production to shipping al throughout Indonesia. There remained some Portuguese colonies but they were unimportant to the spice trade. The British were obliged to pursue their interests on the mainland of South-East Asia and India. The Dutch had complete control over what is now regarded as Indonesia until Napoleon. From 1795 until 1816 Batavia and all that was controlled from there was under either French or British rule. It remained under Dutch rule until the Japanese invasion of 1942. The process of re-imposing their authority in the region was costly and often brutal. It was not until the beginning of the 20th century that Aceh became part of the Dutch empire. Taxes were levied at such a rate that 30% of the total Dutch revenue came from Batavia. In this environment, opportunities for making vast sums of money were numerous and corruption in Government and business became even more evident as the potential for profits increased. The Japanese were, at first, welcomed by the former Dutch subjects who saw the Japanese as liberators. They were soon exploited again by an empire that taxed it and used its people as slave labour. By the time the Japanese empire had crumbled due to military defeats, the Indonesian independence movement had sufficient strength to stand up to attempts by the Dutch to re-impose their rule. This led to a bloody war of independence which eventually wore down the Dutch and mobilised international pressure to grant Indonesia independence and the twin leadership of Sukarno and Hatta to power in 1949. In June 1945, Sukarno announced his Pancasila or Five Principles. 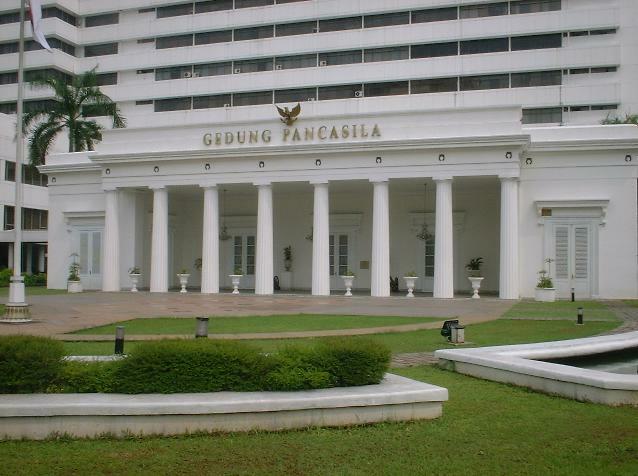 Pancasila has been used as the justification for both the establishment of an inclusive parliamentary democracy and for the abolition of Parties opposed to the Government. A quickly prepared constitution was drafted and presented in August 1945 with 37 vaguely worded articles and with a strong role for the President. A better and more representative constitution was promised. From 1950 to 1959, a period of democratic Government existed with an elected parliament and a constitution which was proclaimed in 1950 which enshrined the majority of the UN Charter on Human Rights. It also provided safeguards against the misuse of power by making the military subordinate to the civilian leaders and including a series of checks and balances for political institutions. This constitution was revoked on the pretext that the Konstituante had failed to produce a usable constitution and that economic and political crises need strong leadership. A “guided democracy” was introduced where the President held all power but claimed to take into account all opinions before making decisions. From 1959 through to 1966, Sukarno held together a shaky coalition of military, Islamic moderates and communist parties. The Communist Party assumed a prominent place in the Sukarno Government and he used it as a way of keeping the potentially powerful Islamic movement out of power. The communist Party had a very strong rural based organisation that ensured that a three party coalition (The Indonesian Nationalist Party, the Communist Party and the more moderate of the two Islamic parties) could control the parliament. Social Justice for all of the peoples of Indonesia. The concept of “guided Democracy demands an explanation! It was a product of the time and place in history where Sukarno was assuming a greater importance in the Government than was originally envisaged for the president. It is notable that when “Guided Democracy” was introduced, Hatta resigned as Vice-President.In Sukarno’s own words: ‘In Guided Democracy, the key ingredient is leadership. The guider …incorporates a spoonful of so-and-so’s opinions with a dash of such-and-such, always being careful to incorporate a soupçon of of the opposition. He then cooks it and serves his final summation with “OK, now my dear brothers, it is like this and I hope you agree …”. It’s still democratic because everyone has given his comment’ . I believe that George Orwell wrote a book about something like this! The fundamental tension during this time was between the demands of the Islamic majority (85% of the population) for an Islamic State and the widely held view that a pluralistic state which accepted the vast diversity of cultural heritage of the many ethnic groups in Indonesia was the best thing for the country. After Guided Democracy was in place, Sukarno used nationalist and anti-imperialist sentiment to justify a strong military rule while ensuring that little political power went to the military itself. There was a successful campaign to “liberate” what is now known as West Irian and even attempted to oppose Britain in its endeavours to create the Malaysian state. At the same time, he erected monuments with strong propaganda overtones throughout Jakarta and built closer ties to China and Russia. A CIA attempt to support a rebellion against the Government in West Sumatra only confirmed the view that the West were imperialists. After a period of increasing political Isolation and expensive military campaigns, the economy was in a poor state, inflation was high and exports of commodities were very low. In an environment where the population had no real say in how the country was run and where the military was frustrated with its lack of influence in political decisions and the Islamic parties felt betrayed, widespread demonstrations against the Government started. An attempted military coup was the spark for a massive killing spree that started in October 1965 and concluded in early 1966. In that time approximately 400,000 people were killed, mainly communists. The killings were probably due to an eruption of sentiment over perceived injustices and were almost certainly orchestrated by the military who were keen to eradicate their main political opponents. Other ethnic and religious violence was also triggered in Bali and in West Kalimantan. The Time magazine in New York described (in the best of Cold War sentiments) the killings as “The West’s best news for ages from Asia”. It remains as a sad legacy that this mass-murder is hardly acknowledged by Western or Asian historians despite its comparability to the Russian and Chinese “purges” of the same era. The Killing Fields of Cambodia a decade later were at least noticed. The political implication was that Sukarno’s power base was destroyed and this left the way open for Major General Soeharto, who was almost assuredly actively involved in the mass murders, to be elected as acting President. Not surprisingly for a General who had been rocketed from obscurity to the Presidency by military power, the military gained a large say in Government over the next 5 years. Soeharto also set about major economic reform and changed the Isolationist policy. I remember my father telling me that Soeharto was good and that Sukarno was bad – such was Cold War rhetoric! Soeharto called his Government the “New Order” It had economic development and strict social order as its main objectives. Political and social order were seen as the flip-side of economic development – the three must always bee considered together. These objectives were in response to the extreme economic turmoil and civil unrest that marked the final years of the Sukarno, regime. Soeharto delivered economic prosperity and political stability. He this became the only political figure of note for the next 30 years. The governing style of Soeharto is “typically Javanese”, according to Adam Schwartz. A Javanese ruler has total power and defers to nobody. The Javanese ruler will ideally seem not to be ruling but to advise their subordinates on how they might best do their job. This advice is a virtual command. There is no scope for power sharing in the way that European and American cultures perceive democracy. The New Order adopted the Pancasila doctrine as its primary political platform. It did, however, interpret this in a different way to that which was intended when it was drafted. The New Order seemed to always invoke Pancasila as the reason to suppress movements that wanted autonomy or any form of political argument. Soeharto set about economic reform based on the policies developed by the Technocrats (financial and economic ministers who implemented a strongly market driven economy) This economic reform opened Indonesia to outside investors and trade and welcomed back overseas aid. The discovery of huge oil and gas reserves throughout the archipelago funded the Government’s agricultural reforms that almost wiped out widespread famine. It also allowed the Government to establish heavy and high technology industries that were not economically viable but added to the prestige of the country while also replacing imports. The world recession of the early 1980’s and the rapid decline in oil prices forced a major change in Government policy. It started to encourage manufacturing in labour intensive industries such as textiles and electronics that gradually reduced the country’s dependence on oil exports (from 70% of GDP in the early 80’s) and provided large scale employment. The country still remained rural with nearly 70% of the population living outside the cities but almost 80% of the GDP came from the manufacturing and oil exports. Political structures were evolved to ensure stability (which really meant to ensure the election of a parliament that would re-elect Soeharto) and to centralise power. The army had a large and pervasive role in Government. It was given 20% of the seats in the MPR (People’s Consultative Assembly). At the same time, the Legal system was made an arm of Government. The Golkar (Functional Groups) party was formed to be the official political party. No opposition parties were allowed. The Civil Service officers were obliged to join Golkar which meant that Government functions were totally politicised. Non-membership of Golkar was an overt challenge to the New Order for anyone in a significant position in Indonesia. Systematic corruption was introduced to ensure that the Golkar Party would always be elected. This was reinforced by the “dual function – dwifuncsi” of the military with both a military and political function. Its political function came to be a matter of collecting and distribution of patronage in return for delivery of “quotas of votes” for Golkar. The military became the bag-men for Golkar and the President. Alternative opinions were oppressed, often violently. Political imprisonment and “disappearances” were quite common amongst those who opposed the New Order. There is little doubt that Indonesia prospered economically under Soeharto but the fact remains that his regime was responsible for instituting some of the most corrupt business and Government institutions in the world. The main beneficiaries of this corruption are now being investigated and tried by the new Government which was elected in June 1999 in the first “free and fair” elections since 1955. While the “Economic Miracle” of Indonesia was still producing growth rates of 7% per-annum, there was no significant internal political opposition to Soeharto. The less attractive aspects of the regime were shrugged off as “what was necessary” for economic growth and social/political stability. Stability was achieved at the cost of repressing free speech and disenfranchising the majority of Indonesian citizens. It was achieved by centralisation of Government and marginalisation of non-Golkar interests. This meant that there were few avenues for debate or political expression. It also meant that the one avenue remaining for people to express ideas counter to the prevailing Golkar orthodoxy was the Mass Rally. The military owed its position in Indonesian politics to Golkar and Soeharto but was also totally subservient to the President, as Commander in Chief. It had only nominal political power and no real power at all. The Muslim movements felt that the fact that more than 85% of the population were Muslim should mean that they should be better represented. Ethnic tensions simmered and occasionally boiled over. Without an effective outlet for the legitimate concerns of the people through the political process, the resulting tensions built up to high levels. It seems that the key causes of the downfall of the New Order can be attributed to a loss of faith in the Government due to a series of factors that had all developed over a long period of time. These included Corruption, Religious tension, Cronyism, First family rorts and the lack of a cohesive political system. The systematic corruption that had started with the formation of Golkar and the military involvement in fund raising, began to take its toll. Every facet of Indonesian life was affected by corrupt practise but productive business was especially damaged by the “indirect taxes”. Small corruption started as the only way that minor Government officials could earn a reasonable living. As well as collecting funds for Golkar, the routine bribes for government services helped to feed, house and clothe the official’s family. Salaries for Government officials were kept low, under the assumption that they would collect “supplementary” income from their job. The familiar sight of the police pulling over a vehicle with several expats in it and collecting 10,000 Rupiah per foreigner from the driver was the most visible expression of this kind of corruption. Because the small corruption was so pervasive and existed for so long, it became institutionalised. Everyone just expected that this was part of life. Whenever Idul Fitri approached, the police and every other official would be actively collecting money to fund their travel home. The burden fell mainly on the more wealthy and those who had to deal with Government more frequently (Business in particular) but there were also excesses and demands on the rural poor during elections that created hardship. Big corruption was another matter again. Soeharto friends and family were to be found in most key political offices and administrative posts. His children became extremely wealthy in a very short time. Favoured colleagues and business associates would always be front-runners in winning Government contracts. At the same time, Soeharto lived a relatively modest lifestyle without accumulating a large personal fortune. The military remained a powerful political force, as long as it remained loyal. Any suggestion of disloyalty was a sure way to end a military career. One of the things that most Indonesians found impossible to accept was the avaricious nature of the Soeharto family. The President was not involved directly but his children were prominent in Government granted monopolies and special partnerships with foreign business interests. Over time, Soeharto had become highly sensitive to any perceived criticism of himself and especially his family. He banned many newspapers and publications, describing them as “unnecessary”. This left the country with no formal outlet for ideas and opinion. The parliament was never able to effectively govern as a representative body. I was talking to a woman on the train from Bandung to Jakarta one afternoon and she told me a story about the Institute of Technology in Bandung. She had worked there nearly 20 years ago when it was a centre of excellence in the South East Asian region. She described the process of a centre of excellence gradually changing to a backwater with little intellectual merit and an academic staff that was afraid to teach anything that maybe seen as critical of the New Order. The students were kept in check by the administration who feared that the smallest expression of dissent could result in cuts to the budget. Instead of being leading light in the electronics industry, the Institute was now barely capable of churning out competent air-conditioning technicians. She advised good students to go to Australia, the USA or Europe for a good education. The invasion of East Timor in 1975 was perhaps, mishandled by everyone concerned at the time. Indonesia contrived a pretext to invade and annex the country which had been abandoned by the Portuguese. Australia had encouraged Indonesia by recognising its right to invade and the international community did nothing at the time. There is, of course a monument to the “liberation” of East Timor. The Dili massacre of 1997 was, however, a key factor in creating dissatisfaction amongst the International community and ultimate withdrawal of foreign capital and aid. The denials of Military involvement and even that it happened at all were proven to be fabrications after a videotape of the killings was smuggled out of the East Timor and televised internationally. The trigger for Soeharto’s fall was the Asian Monetary Crisis of the late 1990’s but it was really an accumulation of the several factors that are identified in the previous section. The riots and the fall-out from these, were the final factor that caused Soeharto to lose support from even his closest allies. It is clear that the riots were not particularly spontaneous and that the most severe of them were organised by a renegade group of an elite military unit. An international report demonstrated that the pattern of rapes, looting and burning was focussed on the ethnic Chinese and followed a distinct pattern that indicated military organisation. 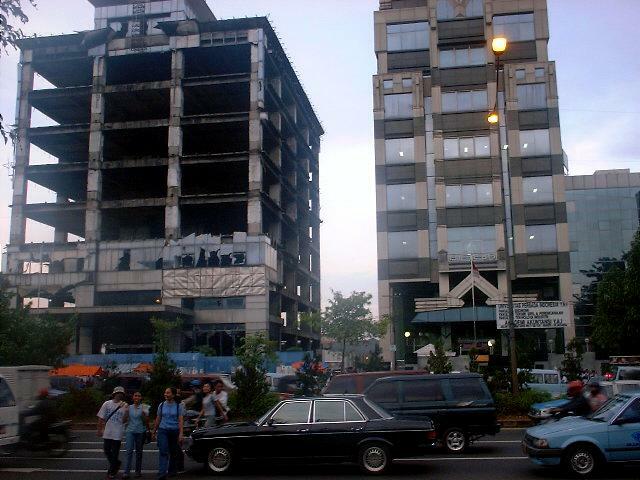 This is one of the many buildings that was burned in the riots in 1999. It is owned by Chinese business interests and was destroyed as a response to the perception that Chinese people were responsible for economic hardships suffered by the poor. Separation of the Military from government. The Military should server the people. What are the political debates? Is Indonesia ready for democracy? How can it hold together under the strain of the Separatist movements in Aceh, Irian Jaya, Ambon and others? Will the military regain ascendency? How long can they be sustained on hope rather than tangible improvements to their lives? Can Indonesia’s justice system properly call to account those who were responsible for the corruption and killing? There are many startling things about the people in Jakarta. The first is that they are nearly all Muslim and that they are highly tolerant of other people’s opinions and beliefs. The next is that the country is in transition from an authoritarian regime to a “free society”. The term that they use here is “Transisi Total” – Total Change. The sense of freedom amongst the people is obvious. There has been a huge change in the country since the election of a new Government in August 1999. The change centres around two key figures in politics. Megawati Sukarnoputri and Abdurrhman Wahid (popularly known as Gus Dur). Megawati is the Vice President and the daughter of Sukarno, the first President of the Rupublic. Gus Dur is the President and a leader of the moderate Muslim party Nadlahtul Ulama which advocates a secular state and adherence to a broader interpretation of Pancasila. Both actively opposed the Soeharto regime during the 1990’s, as his absolute power declined, their combined influence increased. Megawati, in particular was very popular with the people and her party was the most successful in the elections of June 1999. 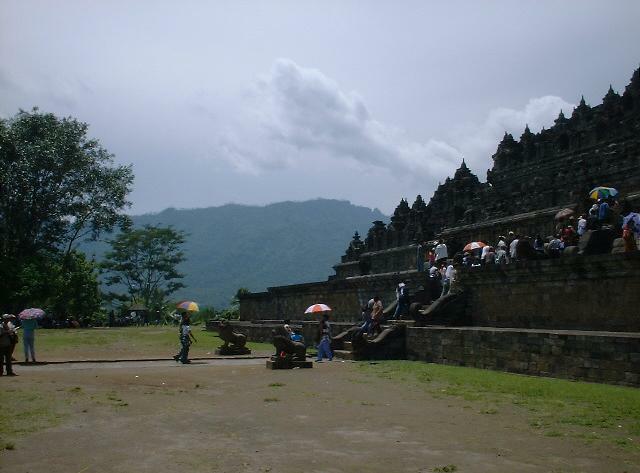 Java has over 2000 years of cultural history. For all but the past 400 years, it has been a leading light in culture and civilisation. You only have to look at the extensive prehistory records to see how long cultural activity has been around these islands. They are the most fertile and productive areas of the world and have been able to support high populations because of this. 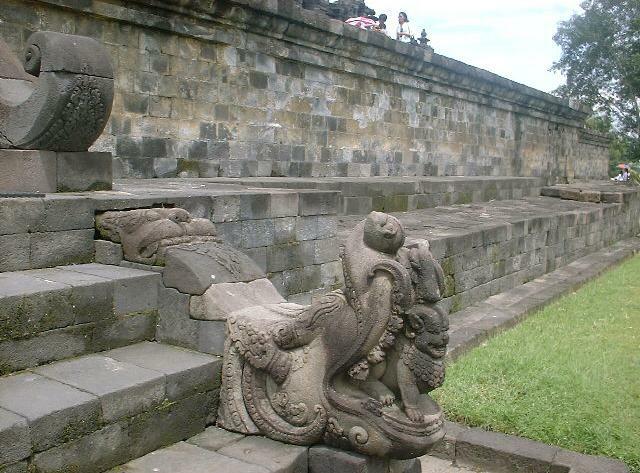 That population and the overall wealth meant that major temples and monuments have been built on Java. The whole island is dotted with them and it is likely that many more have been lost in the think jungles and under volcanic eruptions similarly to Borobudur. Europeans have been reluctant to acknowledge the richness of culture here but there is little doubt of it. There has been sea trading between the islands of the Indonesian archipelago for over a thousand years. The Spice trade that made the Dutch rich was already well established with Muslim traders from the areas of Singapore and Malaysia. I believe that the richness of culture has been enhanced by the ability to absorb and use the best of a wide variety of religions and cultural inputs over the centuries. Nothing in Java is predictable or to be take for granted. You can only scratch the surface of the depth of their culture without living there amongst them for years. There is a totally different concept of morality in SE Asia. There is a belief that those who have power are free to exercise it in any way that they want. If that is for their personal benefit then that is OK. There is a very low value put on human life here too. Those who are low-bred (for want of a better description) are totally expendable. In some ways, it is like a pre-feudal system in Europe. Truth, honesty and goodwill to others are not valued in leaders here. Anyone who makes a virtue of these will probably lose respect. They often hold the people they rule in contempt and will always choose expediency over moral values if it means maintaining their power. Corruption is most likely an adaption to modern life that is necessary for most of the people to survive in an environment where they will likely die if they do not look after themselves. If a leader has no great personal wealth, they lose respect. Therefore it is acceptable for them to find ways to gain personally from office. There is a very big difference between the basically illiterate classes (>80%) and the educated. Then there is a difference between the leaders and the middle classes. There are 1 million telephone subscribers connected in Indonesia. That indicates how few there are who have a comfortable, middle class life that might allow them to have compassion of other people and to not take advantage of an opportunity to benefit from another person’s misfortune or ignorance. 10,000 rupiah is a days pay for most of the population. An opportunity to take that or more from an unimaginably wealthy foreigner is probably too great a temptation. Nearly 40% of the population in Jakarta are hungry for more than half the year. The death rate from disease and poor nutrition (it is sometimes hard to split the two) is more than 100 times that of Australia in Indonesia and usually much higher again in the kampungs. 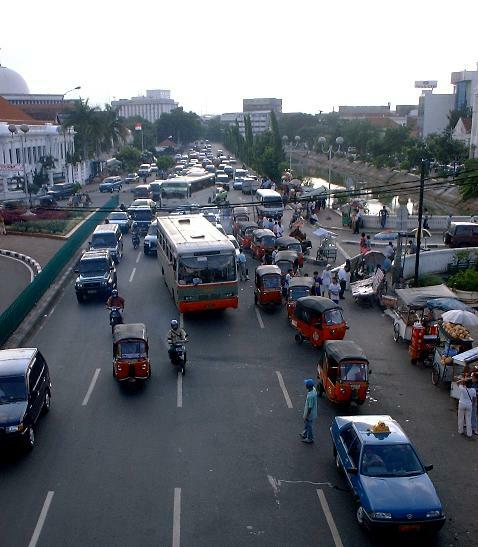 Less than 50% of people of working age are employed in Jakarta. Of those who are, many are “scavengers”. They are employed to collect bottle tops or plastic at rates that allow them to earn two or there thousand rupiah per day. In the rural areas, those who have access to the land to farm can subsist. There is not sufficient land to accommodate the number of adults who are coming through from the tail-end of the population boom (ironically triggered by improved farming methods to reduce rice shortages and famine in the 1960s). These people try to go to the cities for work and often die there from starvation or other effects of poverty. The beggars that you see on the streets of Jakarta (and Manila) are not the really poor people. Those are thoroughly hidden in places that reek of excrement, rotting garbage and crowded humanity. The children have nowhere to play and do not attend school. The school fees of 200,000 rupiah (to pay for materials and the building upkeep) are too much for most of the people to pay. Therefore there are no ways out of these poverty traps. Yet, a mere few hundred meters away, in many cases, there are people with cars, house staff and plenty to eat. If I had a hundred million dollars, I could give one dollar to a hundred million Indonesians who are living in abject poverty. That would feed them for a few days and there would still be another 100 million Indonesians who are living in poverty who would be envious of them and would want to know why it was that they did not get their share. It seems a hopeless task to even attempt to provide that kind of aid. Of course, something like 2 billion dollars of the National income from oil exports disappeared into the hands of the family and friends of the former leaders of the country. That might have made a difference! Not by directly providing food but by initiating small-scale business to do something except feed off the crumbs of the wealthy. Living off crumbs is about all the vast number of food stalls (which never seem to be very prosperous) and the army of parking attendants (pay them 500 rupiah or your car gets a big scratch on it) actually do. Can you blame these people for thinking that it is ok to cheat someone else? Can anyone blame them when they see the example that is set by the leaders? Is “The West” much better than that anyway? – they are the ones who provide massive bribes to get their projects priority and just look at the USA and Australia as examples of Government honesty. 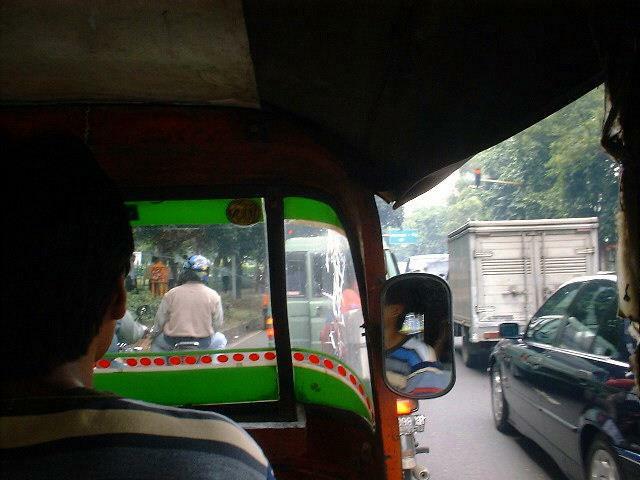 I think that these things are behind a lot of what you see and experience in Jakarta. There is obviously a lot more too but that is a start! There is a long walkway that leads to the temple. It becomes more and more impressive as you come closer. The path from the car park to the temple is lined with hawkers selling hats, water and trinkets. They are banned from the last 100 metres near the temple. Water costs more closer to the temple than in the carpark. 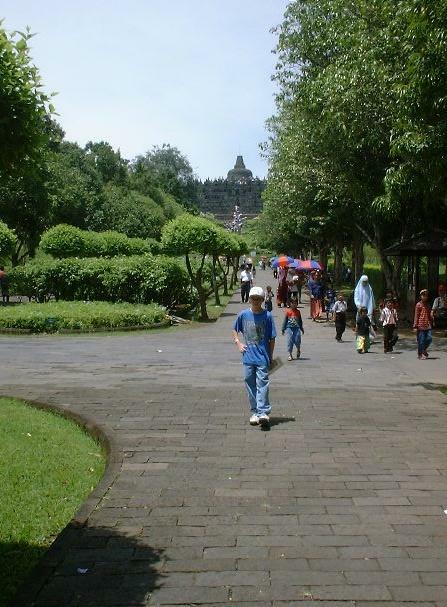 In the background is the volcano that erupted and covered Borobudur in ash sometime before the 10th century. This meant that the temple was both protected and forgotten. It was built in the 8th century when Europe was barely civilised and stone buildings were rare. The temple is organised so that you follow a kind of spiral from the base to the top. 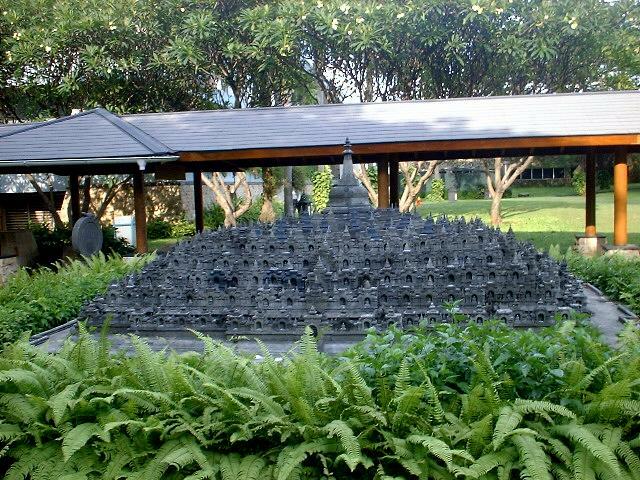 The story of the Ramayana is told in carefully carved volcanic rock. The scale is immense and the quality is outstanding. Quite a bit of the “repair” work done in late Victorian times has been undone to bring the temple (or monument) to close to its original state. Some of the temple was painted in different colours in line with Victorian and Edwardian tastes. This is typical of what you see at every stop and at every level of the temple. Large sculptures are supplemented with smaller carvings to tell the story. Pre-literate societies needed visual representations to understand the stories that define their culture. 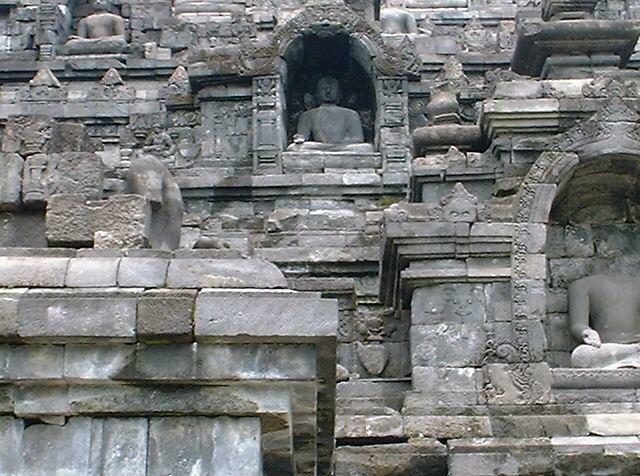 Many of the Buddas were looted by treasure hunters but quite a large number remain. 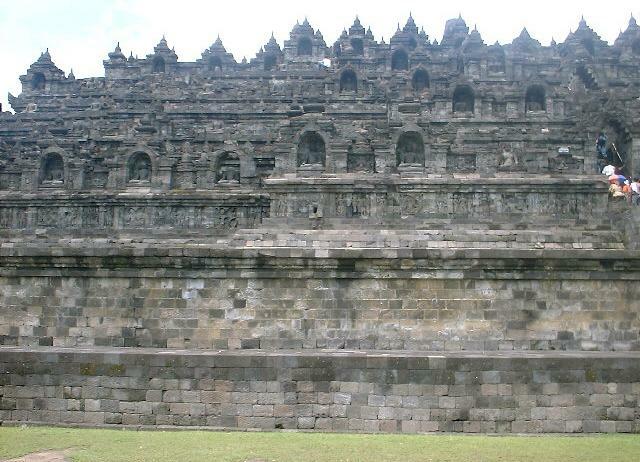 It is a measure of the religious tolerance in Indonesia that there is rarely any vandalism. The images seem oddly familiar, suggesting that cultural transfer was occurring even then. The buddas are also giving instruction on Buddhist practise. Examples of important meditation positions are shown. The natural beauty is incredible. The views are impressive. You feel awestruck as you walk around this temple. Thousands of people can walk across it and you hardly notice them. Each of the bell shaped enclosures contains a Budda with a special purpose and message. The arrangement of them is a numeric sequence and with a special geometry. Again, the beauty is breathtaking. You run out of superlatives when talking about it and I did not have the space to take more photographs. This is one of the reasons that I want to go and revisit Java. A dragon with a lion in its mouth. These are really powerful symbols in Indonesia. Just some idea of how much detail there is on this monument. We are looking at only a small part of one side of the whole. A more complete view to put it all in context. This is a seriously big temple and you get quite tired walking around it all in an afternoon. You can imagine pilgrims travelling weeks to get here and staying for a long time. A scale model of the temple. This model is in the Hotel Borobudur. 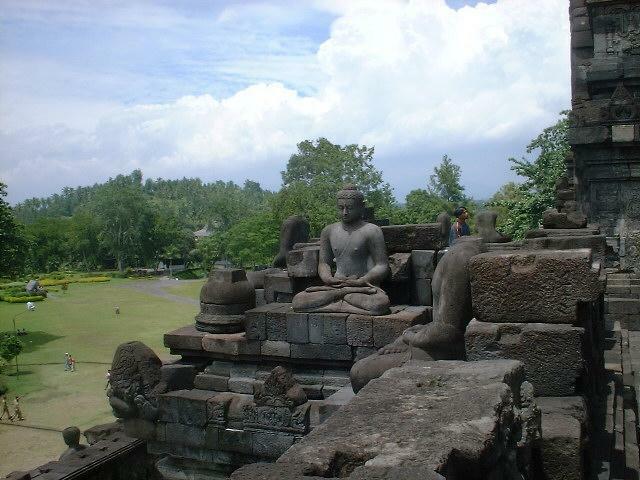 Part of Central Java near Borobudur. There had been a bit of rain before I took this picture from the train as I was returning to Jakarta. 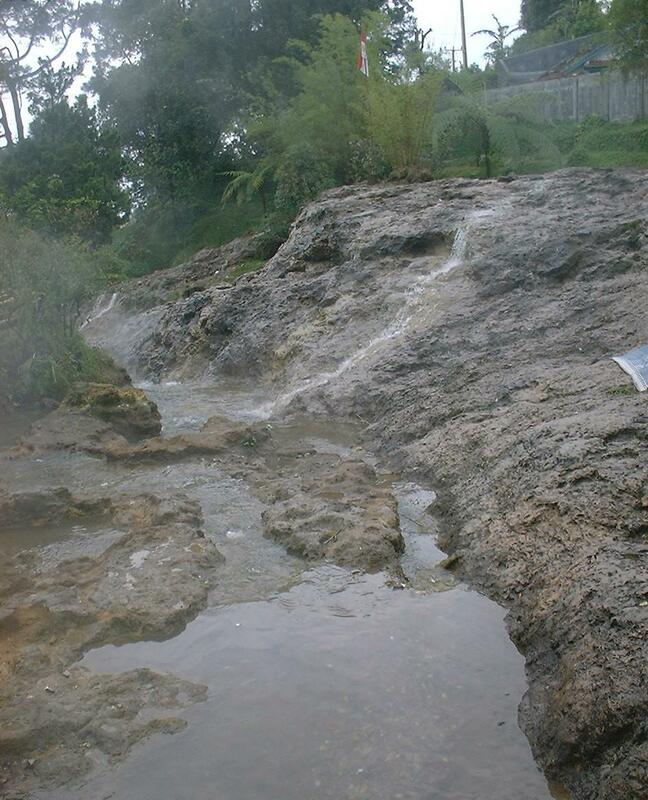 The inside of a volcano at Ciater. It was hot water coming out and lots of it. 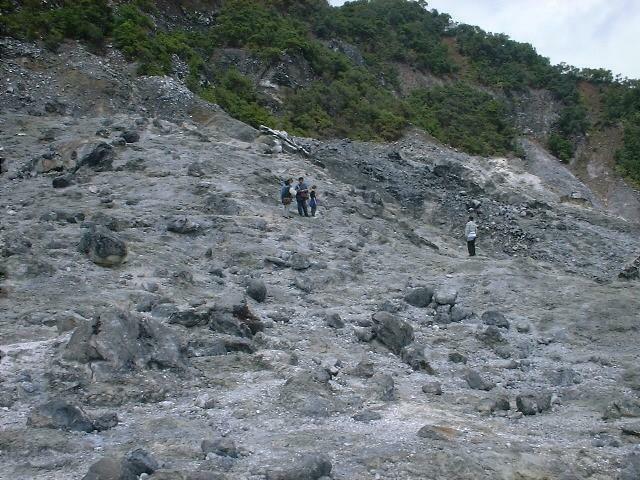 Volcanoes are a feature of Java and the whole of Indonesia. The country is part of the “Ring of Fire” marking the boundary of the Pacific plate and several others. When I was at school Continental Drift or plate tectonics was a controversial theory in Geology. When I studied Geology at university it was accepted fact. Plenty of sulphur smell around the vents. 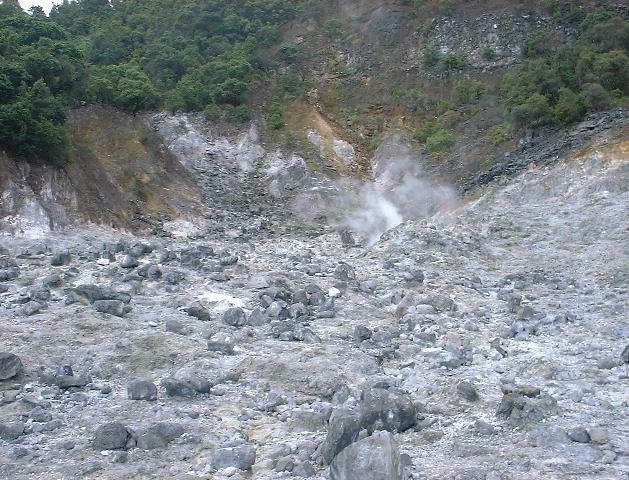 This volcano is relatively tame and has a tourist operation attached to it. Family groups go there for a day trip on weekends. 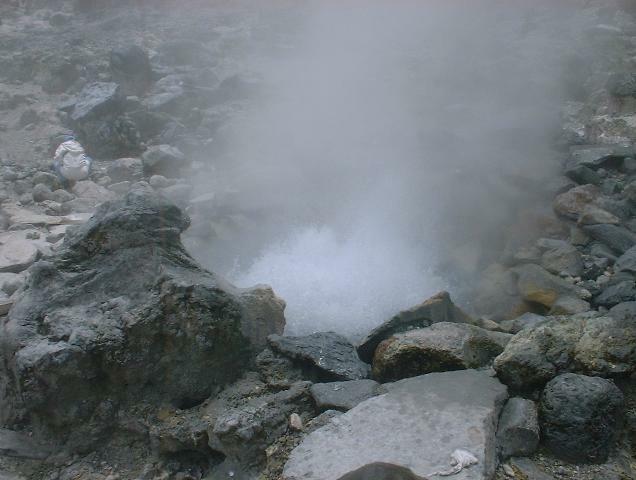 Wherever there is a steam vent the vegetation dies from the poisonous fumes. The rest is very fertile. 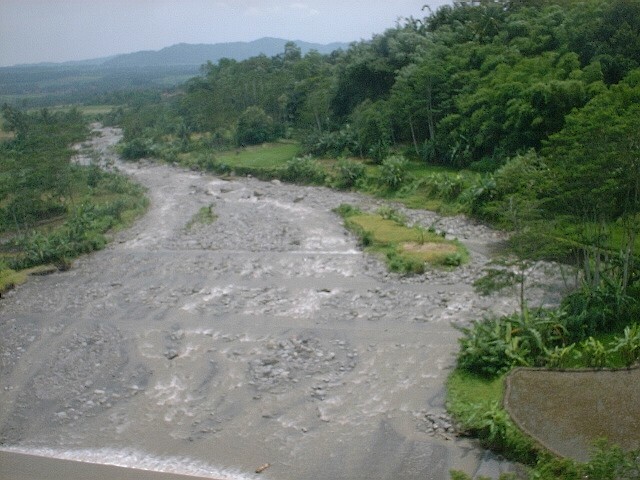 Java has very productive land because of the volcanic activity. A vent and the surrounding area. It is hot but not extreme heat. You can pick sulphur off the rocks here. The greatest danger is hawkers trying to sell you overpriced things. Now that is an active volcano. 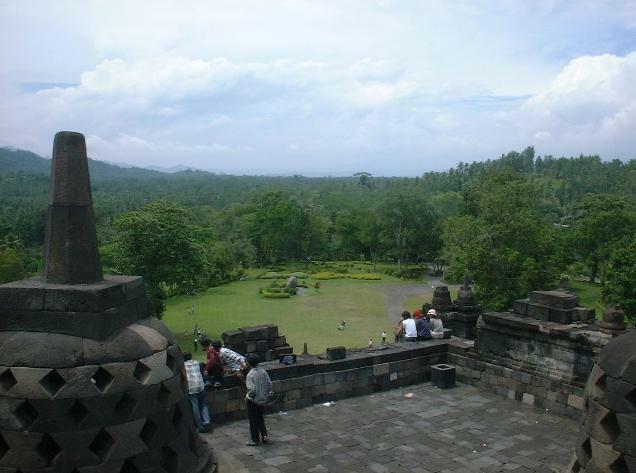 Merapi near to Borobudur. We were going to walk nearer but heavy rain stopped us. 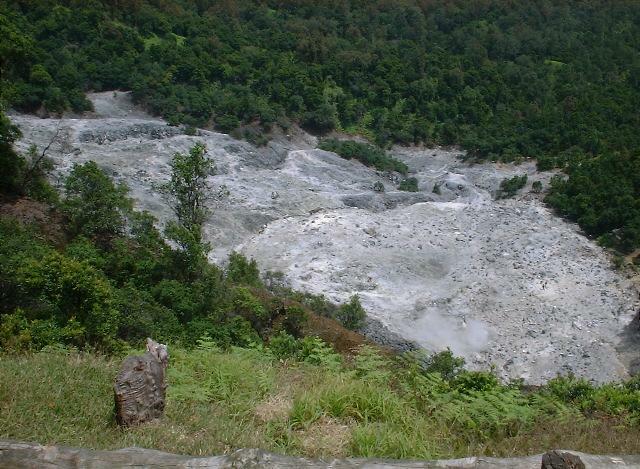 There are fairly regular deaths when people get too close to the crater and get overcome by fumes when there is an eruption. Sometimes there is an evacuation of the local are when the eruptions get quite violent. We stopped and had a late lunch there and watched one of the heaviest rainstorms I have seen anywhere. Street stalls. I ate a lot at these places because the food was great. Also very cheap. One way to travel. Not the safest or most comfortable but exciting! Bajaj is the economy transport method and is faster than pedal powered version in the past. At the hotel Borobudur where I stayed for nearly four months. 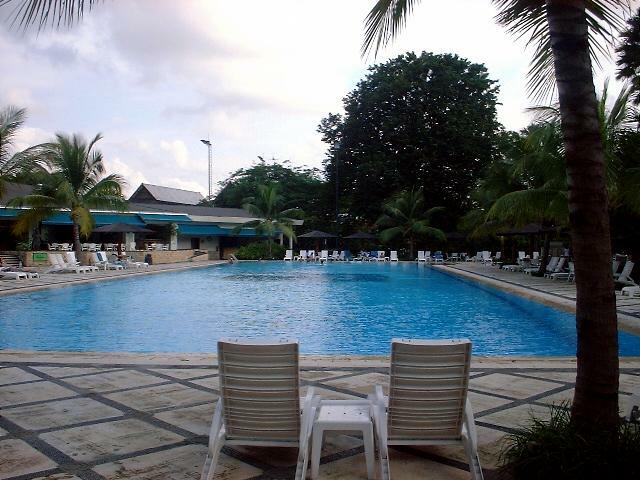 The pool was a nice place to relax on the occasional day off. A nice view, but the buildings next to these had been burned just 8 months before this was taken in riots orchestrated by conservative elements who did not want the free elections. Monas – the national monument. 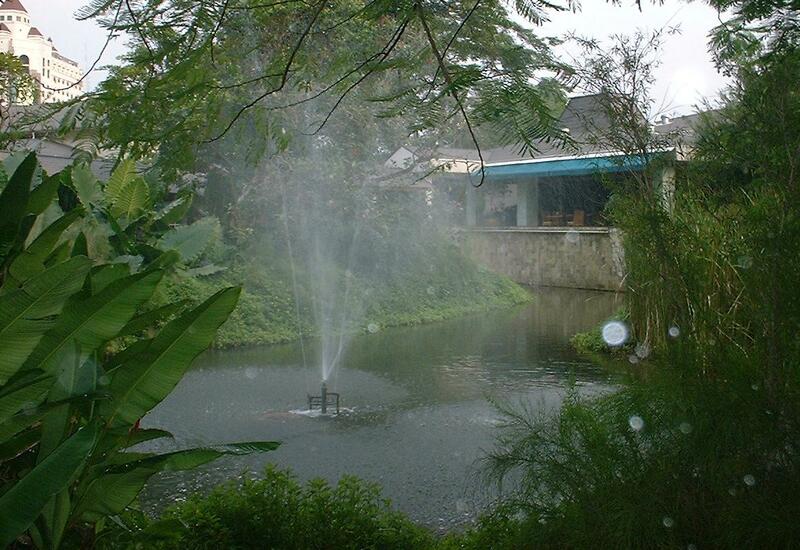 The park around this is Medan Mederka – Freedom Park. 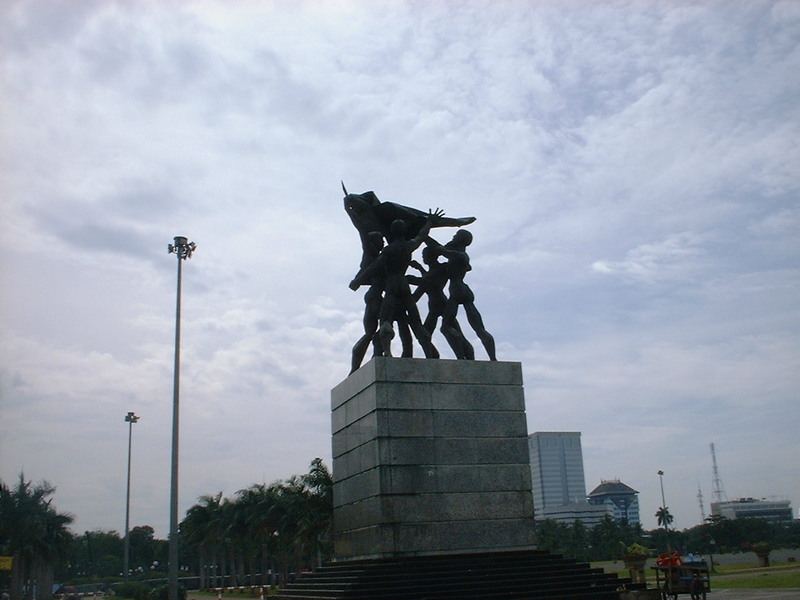 It commemorates the time of freedom from colonial rule in the late 1940’s when Sukarno and Hatta were the independence heroes. One of the buildings burned in the riots. Chinese Christians were targeted in the riots. This is the same thing that happened in the mid 1960’s in “The Year of Living Dangerously”. This is what it looked like on New Years Eve 1999. Looking over Medan Mederka. Translates as Freedom Park or gardens. Normal traffic, except a bit quieter than usual. 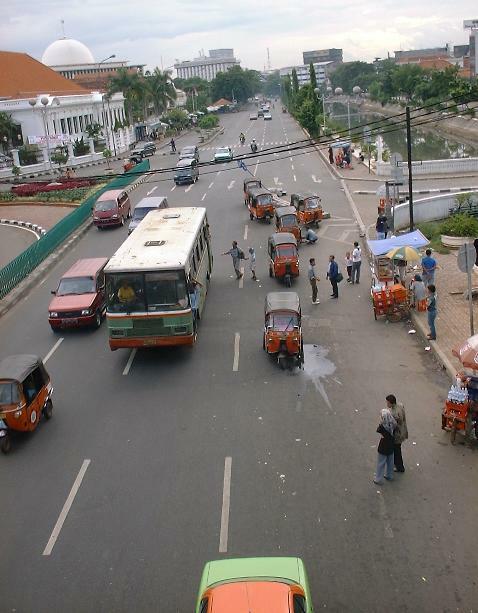 Most of the time you cannot move on the roads because of congestion – even with most of the traffic being motor scooters and Bejaks. Despite the seeming chaos, the roads are fairly safe. That is more like the normal traffic. A thunderstorm hit seconds after this and flooded the road. It is located at the entrance of Passar Baru which is a lovely semi-traditional market that was within a reasonable walk from my hotel. 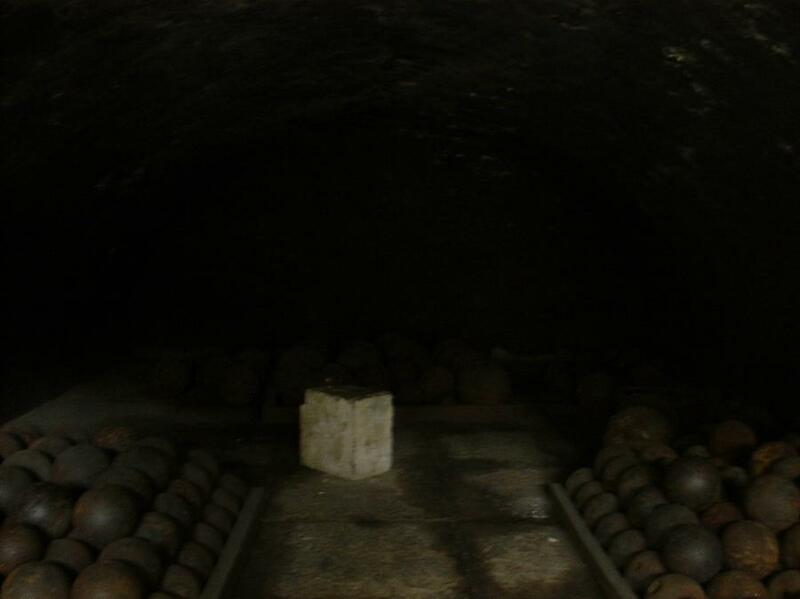 17th Century Dungeon where offenders were imprisoned under Dutch rule. You can crawl into these and see for yourself what it might have been like. The High Court building. A large number of these buildings have survived wars and riots over the last century. They date back to Dutch colonial times. Pancasilla is an important principle of religious and racial tolerance that was articulated by Sukarno and forms the basis of the way Indonesia is governed. Remembering the contribution of Hatta and Sukarno. It is likely that Hatta was the more heroic but Sukarno the most politically astute. The house of the future President Ibu Megawati. She is also known as “Sukarno-putri” which means Princess of the Sukarno line. 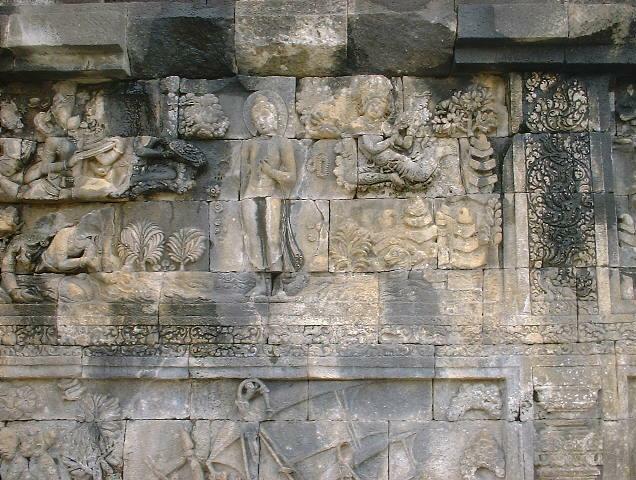 The Ramayana is something that pervades the whole Indonesian/Javanese culture. This is despite the overwhelming majority of people being nominally Muslim. 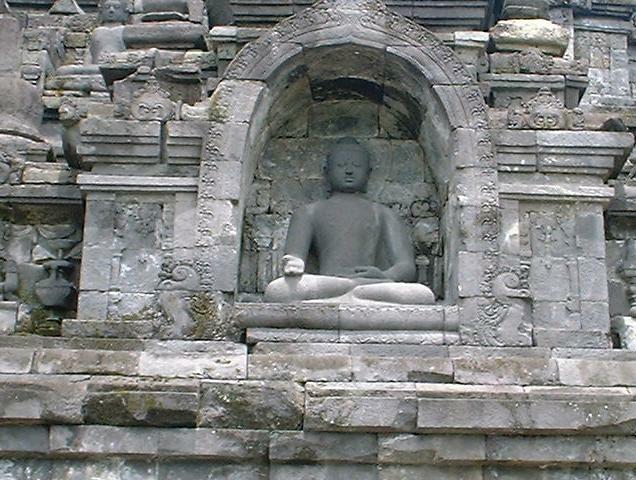 Buddhist and Hindu religions pre-dated Islam but remain important part of the culture. 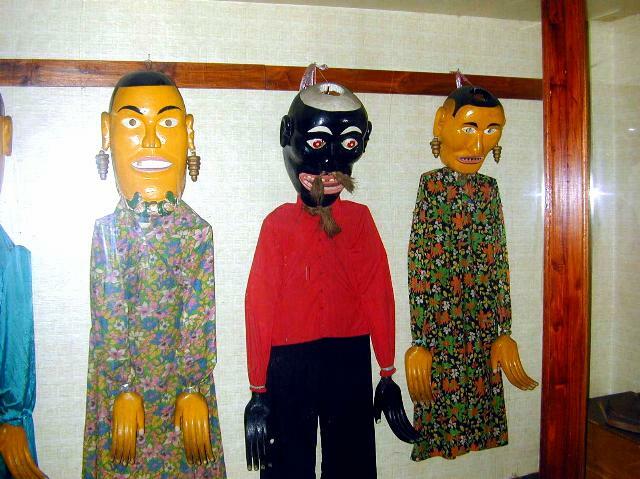 These puppets are for special events that date from the 5th century Javanese culture.